At 61 I should have learned this lesson by now. I’ve told you before that I am a very slow learner. I don’t do rest well. Part of my upbringing was that we always had to be doing something. If we weren’t always doing something, we were lazy. Life was always a flurry of activity in our house. We were very connected to the church. If the doors were open, we were expected to be there. We never heard about Sabbath rest. Sabbath was just another day to pack in more activity: Church, Sunday School, meetings in the park, youth group, Sunday evening church, and then there was some activity after church. Rest? Not in your life. But I am learning the hard way that there comes a point of no return when it all this flurry and hurry catches up with you. This is not life the way God intended it to be. Work is very much part of life. God addresses work in the Bible. But He also speaks about rest and the need for it. Somehow in our own deceived ways, we have bought into the lie that we don’t need to rest. We pack as much into our lives as we can and wonder why we have no energy, why life seems to be flying by, and for some, it is like a merry-go-round that we can’t get off. Dr. Mark Swenson says that we have failed to build rest and margin into our lives, and sooner or later, it will catch up. If the God of the universe after spending six days creating the world as we know it, and on the seventh day rested, what makes me think that I can work seven days and not rest? I am not here to tell you how to do this. 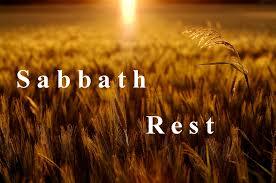 Is Sabbath rest for you on Sunday, or is it another day? We don’t have the space to debate all that. BUT I do know this – God wants us to rest and enjoy the recreating our bodies and minds. It’s something to think about. Great words of encouragement, thank you!